It’s time for another Saturday Seminar at Calvary! If you are a Bible Fellowship teacher, part of a Bible Fellowship teaching team, or just love to study the bible, you will not want to miss this training opportunity to learn from one of our Southeastern Baptist Theological Seminary professors! 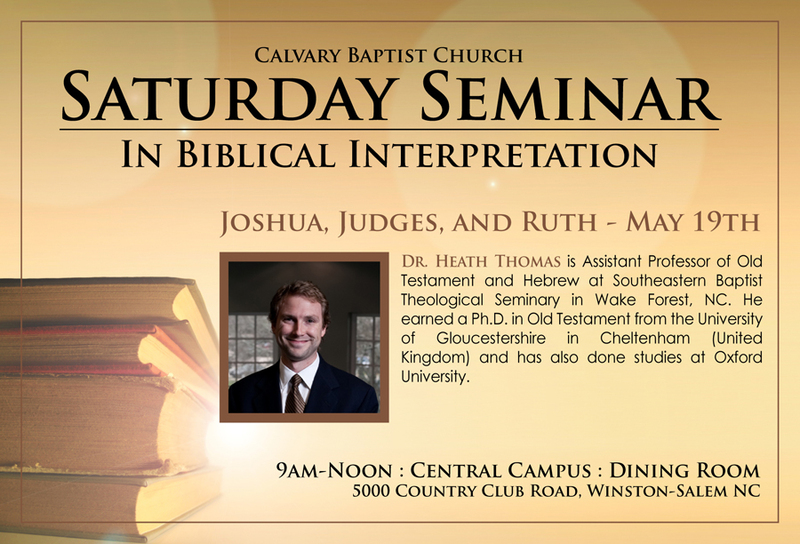 Dr. Heath Thomas will be at Calvary on Saturday, May 19th from 9am-12noon. Dr. Thomas will be walking us through Joshua, Judges, and Ruth. Dr. Heath Thomas is Assistant Professor of Old Testament and Hebrew at Southeastern Baptist Theological Seminary in Wake Forest, NC. He earned a Ph.D. in Old Testament from the University of Gloucestershire in Cheltenham (United Kingdom) and has also done studies at Oxford University. Heath is fantastic, this will be fantastic. Just (1) don’t call him Heather, and (2) don’t use the word “Hobbit”. Ah yes, he is great. This is our 3rd time hosting him. He’s been with us in long and in short hair. Perhaps I’ll introduce him as Dr. Heather Hobbit.